← Oh, what a world. Up until yesterday, I never really thought that was a problem for me. I drink enough water to satisfy my thirst, and sometimes I drink a LOT of it. But I never thought I could drink so much water that I’d make myself sick. I’ve only overhydrated a few times, but every time has been sheer hell. You feel even more thirsty than before you drank water, but if you drink anymore you feel like you’ll explode. I overhydrated yesterday, but for the first time, I was aware that that was the problem. I recognized it, accepted it, and tried to not let it get the best of me. 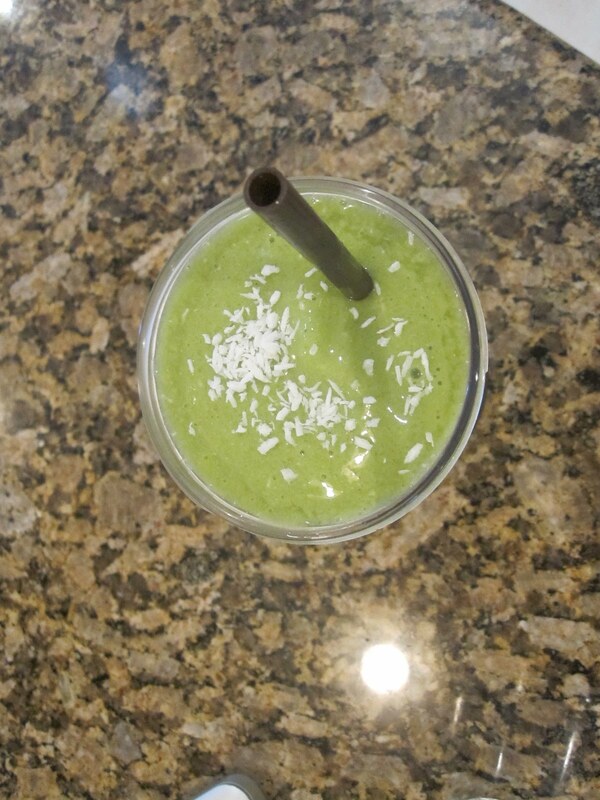 I made a pineapple-mango smoothie with 1 cup pineapple, 1/2 cup mango, 1 cup almond milk, spinach, 1 scoop vanilla protein powder, 1/2 tbsp shredded unsweetened coconut, and stevia. 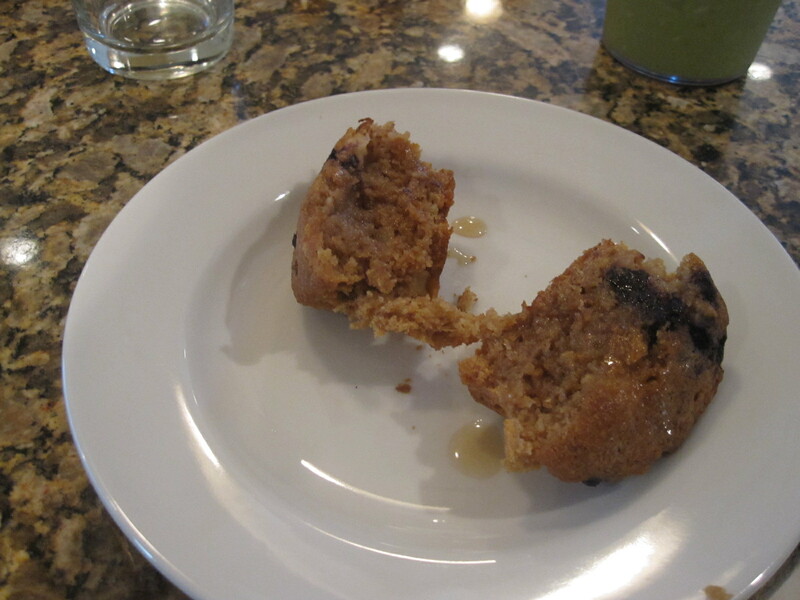 On the side, a Berry Vitamuffin with a smidgen of coconut butter and agave nectar. I love the taste of coconut butter. It has a richness that regular butter doesn’t possess, plus the nutritional benefits are wonderful. I just wish the Vitamuffins were bigger. Yes, they’re only 100 calories, but that’s a teeny weeny 100 calories. I’d rather have a bigass Stop and Shop corn muffin for the additional 50 cals, but my mom threw out the last one. Boo! Yesterday was my first day of post-graduate nondegree study, so I had to pack a lunch! I felt like I did when I was five and my mom packed me a peanut butter and jelly sandwich, so I went old-school. There’s really no meal I like better than a simple PB and J and an apple…unless it’s cream cheese and jelly, but I ran out of Tofutti! I originally put tempeh on the sandwich as well but I decided against it, as A) I didn’t want to try anything new when I would be sitting in class all day and didn’t know how it would react in my stomach, and B) tempeh and peanut butter sounded a little weird, even for me. Maybe another day I’ll try it! During my second class of the day (Children’s Literature…this class is going to be AMAZING), I snacked on this thing. It was actually really good, and satisfied my peanut butter craving. This was around the time where my overhydration started to show itself. I had slugged down a lot of water before my run, and since I don’t work out nearly as much as I used to but still eat a lot of fruits/veggies, I get to the point where I really don’t need to drink as much water as I used to. But since I’m used to drinking that much, I slug it down anyway. Cut to me during class yesterday: puffy, dizzy, and overall feeling lousy. I realized maybe I’m overhydrated and underfueled? and decided to buy a vitaminwater zero after I got out of class. I took a few sips, and avoided drinking my water for a while. I went to the bathroom the second I got home, and just like that, my bloated, puffy discomfort went away. Our bodies are so amazing, aren’t they? Of course, you have to listen to it. After that, my appetite was back in full force. I had marinated some tofu during the day in teriyaki sauce, and when I got home from class after a quick stop at the grocery store (FYI: Honeycrisp apples and Edy’s Pumpkin and Apple Pie ice creams are now in stock! HELLO, autumn!!!) I threw it into the oven and baked it alongside a big handful of asparagus sprayed with Pam and sprinkled with salt, epepper, and red pepper flakes. 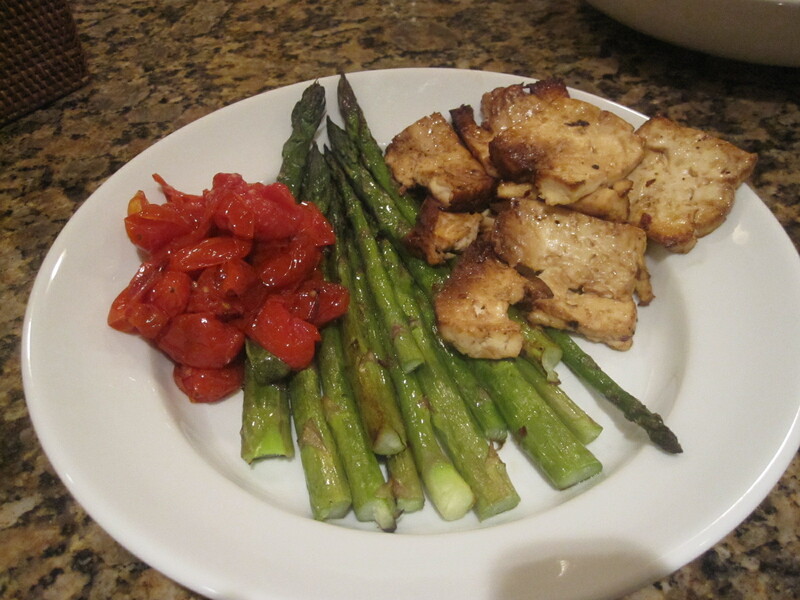 Alongside it, I enjoyed some roasted cherry tomatoes my mom had been making when I had first arrived home. She and my father had cheesy pasta with basil and the tomatoes, but I had no idea she was going to cook! I had already marinated my tofu. Now, if you know me at all you know that I HATE tomatoes. I love marinara, tomato soup, ketchup, and all that is tomato flavored, but regular tomatoes are the bane of my existence. However…these were amazing! they burst like little cherries in my mouth and contained a rich, robust flavor. I’ll have to have these more often! I think it was the olive oil and seasonings that realy put them over the top. But still. Absolutely wonderful. 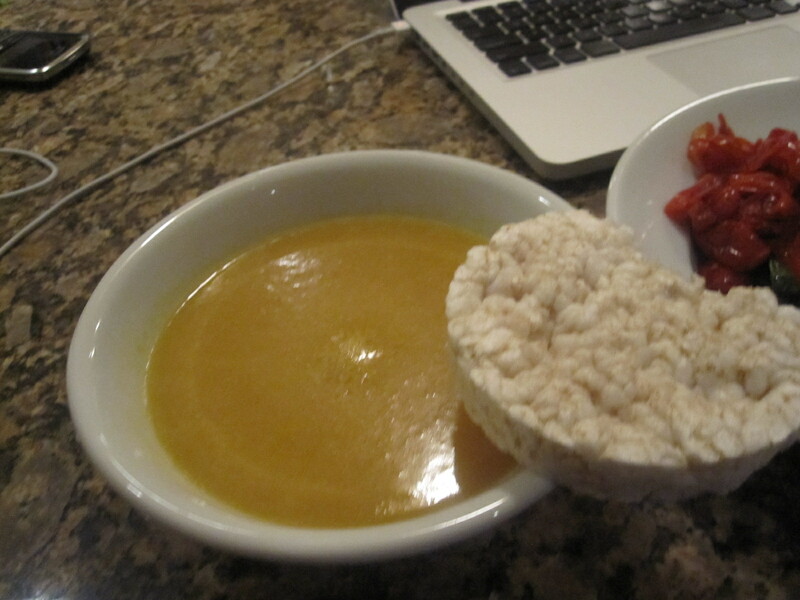 Alongside it, some Butternut Squash Soup and a rice cake. This brand of soup was Nature’s Promise, and it was way too thin. It was almost like squash juice. And it was so sweet! 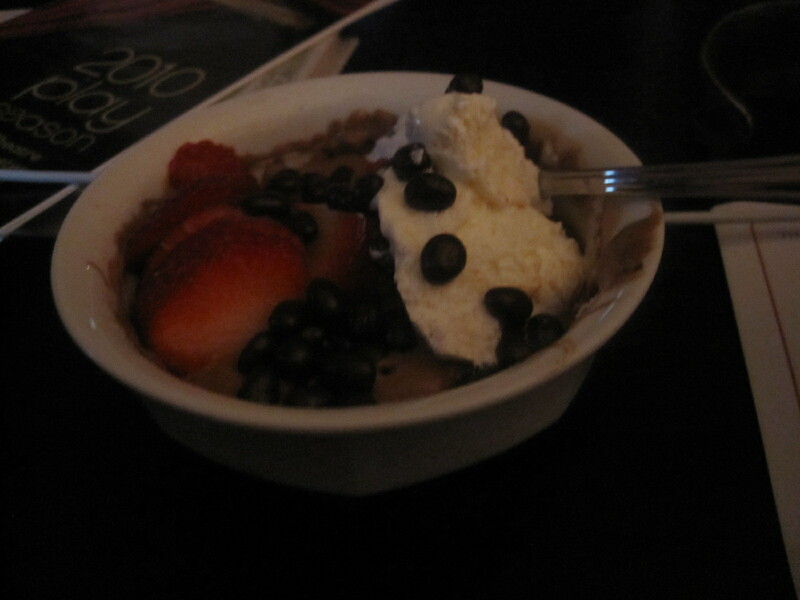 I couldn’t finish the bowl, it was so sugary. And you know me and my sugar. We’re besties. Today I went off to the gym and did 35 minutes of intervals on the elliptical and really worked up a sweat, but I tried not to drink a ton of water beforehand as I knew what might happen if I did! And it seems to be working. 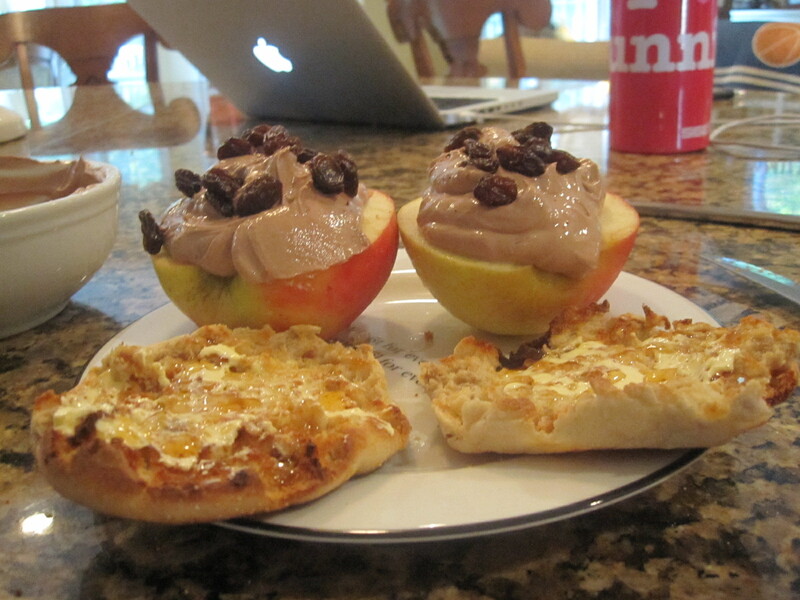 I came home and enjoyed some protein yogurt pudding (this time I managed not to make a mess by putting the stevia, cocoa, and protein powder in the bowl FIRST, then putting the yogurt in) on top of a halved Pink Lady apple with 1 tbsp raisins divided on top, along with an Apple Cinnamon English Muffin topped with Smart Balance and Honey. Also, this time I used Fage 0% because I ran out of 2% but it was still yummers. This is not an original idea. I got it straight from Angela, and I really liked it! 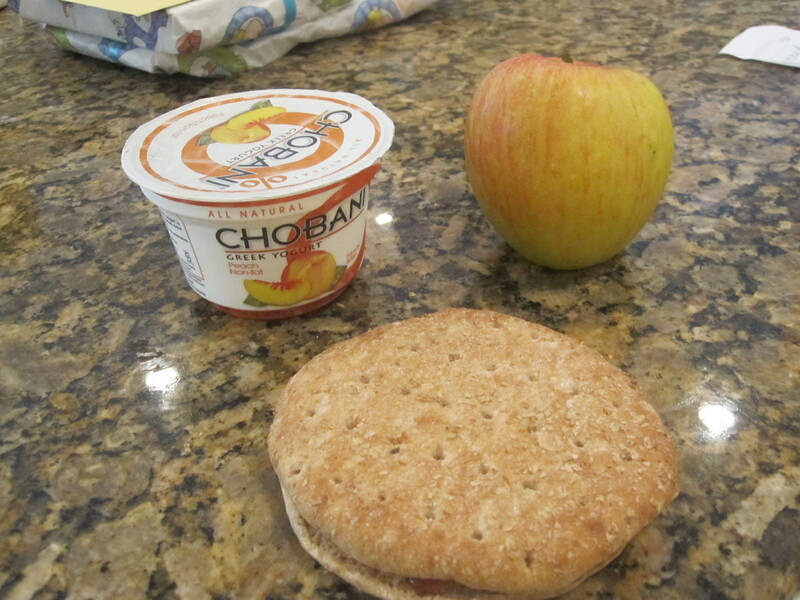 However, I didn’t get a good taste of the apple as there was so much yogurt on top of it! And it was kind of messy. In short, it looked absolutely adorable and really plated nicely, however I think I’ll stick to my ‘slice and dip’ method. But it looked so cute so thanks for the great idea, Angela!!! Now off to pack my snacks and lunch for school! I have one class today but it’s a long one. 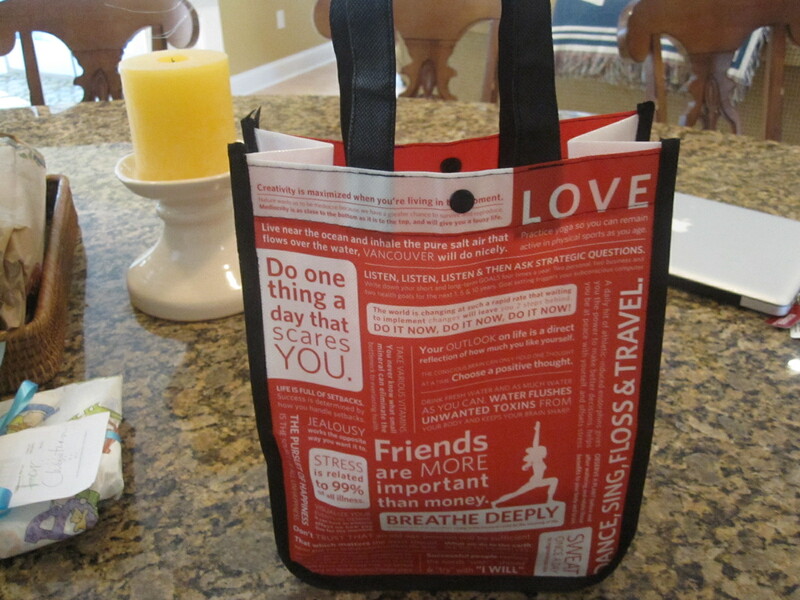 And I can’t wait to reuse my Lululemon lunch bag! When you workout in the morning, do you eat anything before you work out or wait until after? I usually eat a little something just to get my motor running…although today I didn't wait enough time for it to digest and got a really bad side cramp! Usually it's 1/2 a Clif Z-Bar, or a Medjool date, or 1/2 a Clif Mini (I like the Clif Minis the best). 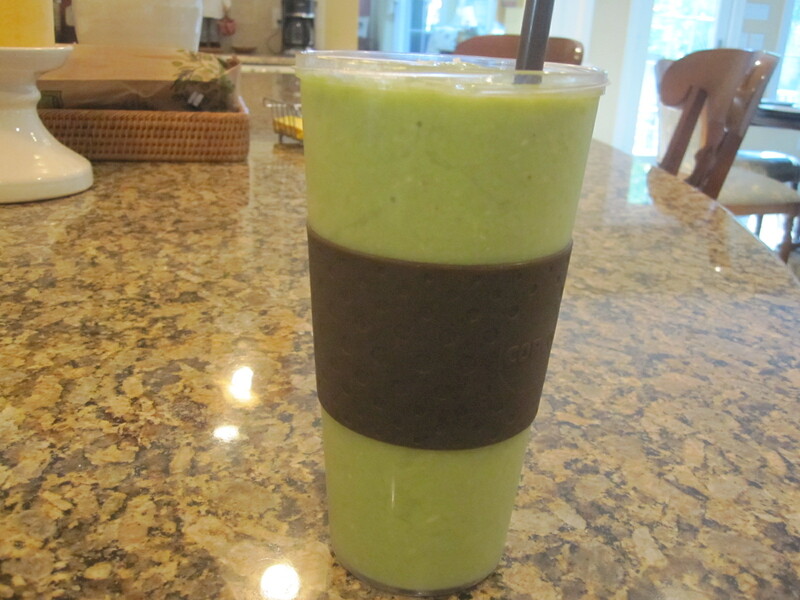 I keep the morning pre-workout food to a minimum-about 50 to 70 calories-since I don't run over 6 miles usually. 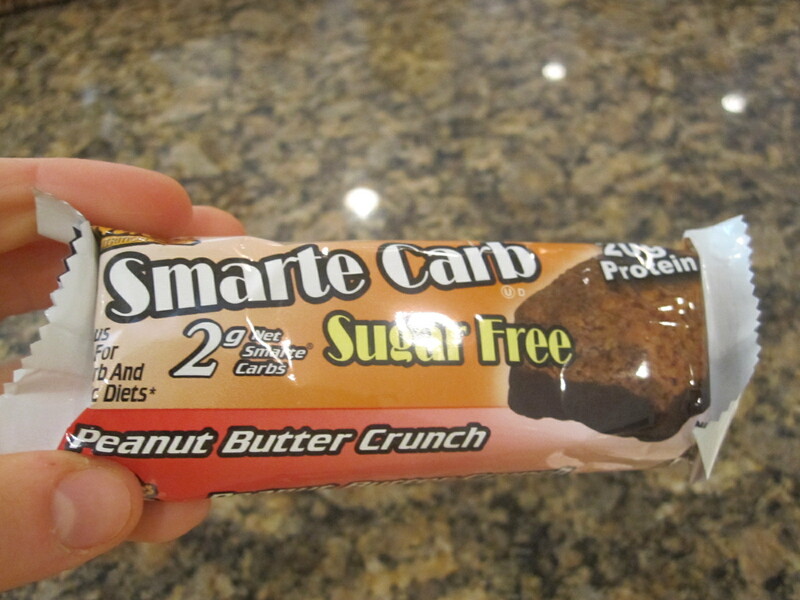 But having just a little bit of carbs/sugar in my system helps my performance, plus it keeps me from bonking! Then when I'm done, I eat whatever breakfast I'm in the mood for, although I try to incorporate lots of protein and carbs.